Thank you, Dr. Cox, for taking the time and effort to write the book. 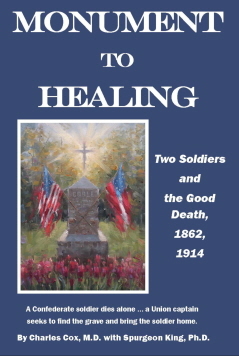 The reader will soon find this to be much more than a story about a single Confederate soldier dying in action. It’s a story about a sense of propriety lingering in a man’s heart for over fifty years. It’s a story about a young widow left alone with four young children to make a living on fourteen acres of Middle Tennessee soil. Thank you again for all you’ve done to preserve this story for future generations. It’s a job well done. I enjoyed so much meeting you in Hohenwald and look forward to more discussions of Coble family history with you.